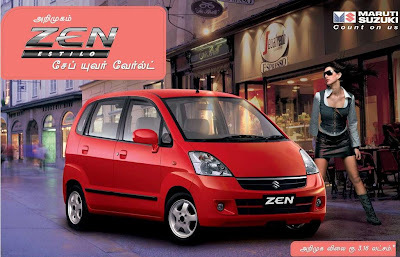 Could you please click on the picture and read the Tamil line written below the Zen Logo. Now whats that written ? Sape ? Safe ? One thing is clear. Its crazy. This Ad appeared on the Dinamalar paper. This paper goes around Tamil nadu. With mostly Tamil speaking people. Why the hell are these tag lines appearing in Tamil, with english pronunciation ? They could have been totally Tamil, or Totally English. What is the objective of having it this way ? I totally dont understand. Even worse is the Hindi taglines transliterated in Tamil. What the **** is that ? Who on earth does that help ? People who localize the Ads that are released nationwide, better take some care to make it completely local, or leave it as it is. The ones like what is shown above has no value. did that mean 'Save your world' ? or 'Shape your world' ? (i guess its the latter, it took some 5 mins for me to figure out what they really meant :-/). Bharathiar birthday'um adhuvuma untendhu post'e illaya. ennapa aachu ?